In this series of blog posts, I’ve been discussing connections to my neighbors found in my family tree. Having moved into a cul-de-sac about ten years ago, it has amazed me that I have discovered either relationships, or connections by marriage with several of my neighbors! All of us were new to this neighborhood, and new to each other. I had never done any genealogy so we became acquainted through shared interests and proximity, then I discovered the genealogical connections. My next door neighbors were a delightful couple, named John and Dora Burgess Pryor. John was an accomplished genealogist at age 92! He’d been researching for years the old-fashioned way– no internet! He and his wife had traveled the towns and states, and spent many hours in libraries and courthouses, poring over tax records, marriage and death records and the like. They’d walked cemeteries and taken copious notes! I was impressed with what John had accomplished and he inspired me to think about creating my own family tree. Many of my readers know I have severe heart disease and can’t walk far or stand long. I had always loved to garden, but unable to bend over or stand for any length of time, I thought my gardening days were finished. John was in his nineties as mentioned. He could not stoop or bend over either, so he sat on the ground and scooted or crawled to where he wanted to go, gardening up a storm! I watched him work and again was inspired! If this 92-year-old man could sit on the ground and garden, I could too! What a pair we made. Other neighbors got used to seeing us crawling around our gardens! I loved it, and hadn’t had as much fun in years–playing in the dirt! We both had beautiful flowers to show for it as well. Not that we could take all the credit! John’s wife Dora was quite a bit younger than John, and she could and did work rings around both of us! She was the true gardner! Her yard was spotless and beautiful! I didn’t even try to keep up, just tried to enjoy what I could do. My own husband didn’t consider himself a gardener, but he was the labor end of our efforts! Dora and I became great friends! Unfortunately, John passed away a few years ago, and even though he has left a hole, we love Dora with a passion! John passed away shortly after I started my own genealogical work, so we had only a couple of opportunities to compare notes! What a loss. Just like with the Voorhees and McLaughlins, it wasn’t long until I was seeing Pryors and Burgesses in my tree! What’s up with this?! My neighbors thought I was crazy as they heard me saying again, “Dora, I think we are kin to each other…and I might be kin to John as well! LOL Like before, I asked Dora to let me work on her tree a bit so that I could check out these things I was finding! The “coincidences” are amazing in my book, and unfortunately, I can’t even remember them all! I wasn’t thinking I’d ever write about them, so I noted them, talked about it with Dora, then went on with my research. But look at this. As you know, my paternal grandmother’s line is Hogue on one side. Hogue is Scottish, and Pryor is generally English in origin. However, I found the name Pryor all over my Hogue family tree! My neighbor John was named John Hamilton Pryor. Right there in my tree was a John Pryor Hogue, a Pryor Hogue, and a John Hamilton Hogue! My neighbor John was born and reared in West Virginia, and I could trace my Hamilton Hogues right to West Virginia! I could never quite prove the kinship however. After John passed, I took a dna test to aid with my genealogy research. As I learned more about the Hogue dna, I discovered that the Pryor and Hamilton Hogues were not in my Hogue haplogroup! Hard to believe, but definitive. Nevertheless, what are the chances we’d have these name connections moving in next door to each other from different states and backgrounds? Dora and I not only shared the love of gardening, we became red hatters together and played like there was no tomorrow! She and Linda and I shared our strong faith as well, we were great “pray-ers”! Dora and Linda were avid volunteers in the community, at their church and in other endeavors. I couldn’t believe the blessing of moving next door to such a dynamic, loving woman. Burgess and McKay (pronounced McCoy) were her main two genealogical lines. Her McKays were from Scotland like my Hogues, and I saw them everywhere, along with Burgess! After I got my dna done, I began to zero in on my exact relationship to her Burgesses! We shared a third cousin! However, we were kin to that same person by opposite sides of the family, so we were still only kin by marriage. But, hey, it seemed amazing to me! Thomas Burgess was born in 1814, He was one of fourteen children –so we share 14 third cousins! LOL Just think, 200 years ago, Dora’s family and mine were the same, our families , or our kin folks lived together in West Virginia! When you look at the history for my own 9th great-grandfather, Nicholas Martiau (blog post here), the similarities are striking and the shared experiences so strong, they surely must have been acquainted! From John Baer Stoudt’s book entitled Nicolas Martiau –Adventurous Huguenot, we learn that Nicholas “left England and sailed for Virginia arriving in June, 1620. His construction of a fence or palisade around the Jamestown Fort helped the settlers survive an Indian uprising in 1622. He …was elected to the House of Burgesses from the colony. Later he served as a Burgess from Elizabeth City, Yorktown, and Isle of Kent. Nicholas also served as a Justice for the early court system of Virginia–with court sometimes being held in his home.” It seems they must have known each other, I cannot imagine how they would not have. How can we explain Dora and I moving next door to each other and becoming close friends, 400 years after our grandparents worked and played together as well?! It certainly seems as if our families are connected. Add to that my connections to the Voorhees and McLaughlins across the street…well, what do you think? Is it serendipity, reincarnation-traveling with our tribes, or coincidence–the definition given us saying “coincidence — a miracle where God’s presence is invisible?” Kind of feels like that to me–like a miracle of friendship! Categories: Burgess Family, Chew Family, Genealogy, Hogue/Hoge/Hogg family posts, Interesting Phenomena in Our Family Trees, Jamestown Ancestors, Martiau family posts, Pryor Family | Tags: Coincidence, Dora Burgess Pryor, Jamestown, John Chew, John Pryor, Nicholas Martiau, Six Degrees of Separation, Time Travel | Permalink. Born and raised in Richmond, Virginia, we lived only a couple of hours from Jamestown! We went there often in my childhood, to Yorktown and Williamsburg as well. My mother was very interested in history, and wanted to be sure her children understood their Virginia history! She was also very interested in family history, but as far as I know, she had no idea that she had grandparents who had lived in Jamestown! Oh my gracious, she would have been so excited to know all this I’m sure! I am excited as well! As my genealogical research progressed, I began to realize we had some lines of ancestors that extended back to that time frame. However, I had not investigated particularly if we had ancestors who were on the “approved” lists from the Jamestown Society indicating that you did indeed have ancestors from Jamestown. As I approached the end of this 52 ancestors in 52 weeks challenge, I decided to write about some of our first ancestors–the Huguenots, Pilgrims on the Mayflower, and Jamestown Settlers. I gathered all the lists I could find, and started searching! Some were easy as I readily recognized the names! Several were amazing to me, because I had perhaps stopped at a daughter or son, never dreaming that including one more generation would take me to Jamestown! Wow! Altogether, as of this writing, I have identified twenty grandparents who were present in Jamestown, and therefore would make my siblings and I , and many of my cousins eligible for membership in the Jamestowne Society. That is simply amazing to me! I am going to list all twenty of our grandparents here, and highlight the ones I’ve already blogged about–so that you can simply click on them and see their story. At the end of this post, just for information’s sake, I will list their relationship trees. Therefore cousins can tell who comes through the Houchins, the Langhornes, the Omohundros, etc. and see their own relationships. The very first discovery I made that I’d not known of before, just blew me away! I was looking at the lines, and noticed a Mirian Newport married to a William Hatcher. It was the Newport name that caught my attention. I knew I had seen that name on the lists. I thought I’d extend her line a bit, and who turned out to be her father? Oh my gracious, none other than Captain Christopher Newport, Captain of the Susan Constant and in charge of all three ships that sailed to Jamestown! I had no idea, and was so excited! He is our/my ninth great- grandfather! His daughter Marian is my eighth great-grandmother and is a qualifying ancestor in her own right! Her husband William Hatcher, my eight great-grandfather is identified as well! William Hatcher served for many years in the House of Burgesses. If you like interactive websites, and if you’d like to know more about the women in Jamestown, there is a wonderful website titled the National Women’s History Museum. There we learn that the Englishmen named the river that flows into the Chesapeake Bay the James River and named their settlement Jamestown, both to honor their King, James I. The settlers of Virginia were looking for gold especially, but none was to be found! In this same website we finally learn about the women in Jamestown! ” For over a year after the founding of Jamestown, no English women lived in the colony. Then in October of 1608, two women arrived with the “Second Supply” of men and provisions. Thomas Forrest, listed as a gentleman in the supply lists, brought his wife, Anne Forrest, and her maid, Anne Buras. Buras was about fourteen years old when she arrived. She married the carpenter John Layton within a year, an event that Captain John Smith described as the first wedding held in Virginia. Anne Layton later gave birth to a daughter, named Virginia. 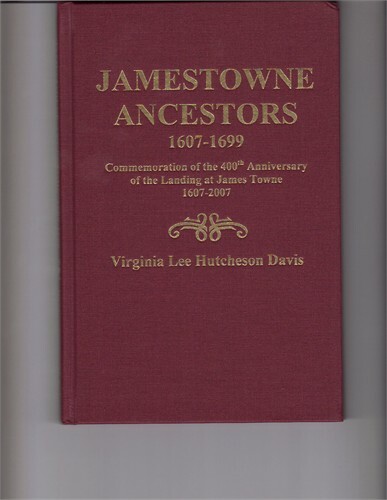 While the Laytons are not mentioned again in later records, their arrival represents the beginning of families in Jamestown. “Her daughter, Jane Pierce, married John Rolfe, the widower of Pocahontas. Pocahontas had been the favored daughter of Chief Powhatan, and her marriage to Rolfe in 1614 brought over eight years of peace between the settlers and Native Americans, during which the colony was able to produce profitable tobacco. Pocahontas died in England in 1617, and Rolfe returned to Jamestown. He became active in colonial politics and married Jane Pierce later that year. They had one daughter, Elizabeth, also named for the powerful Virgin Queen.”National Women’s History Museum. Jane Pierce was my 10th great Aunt, with her sister Edith being my 10th great-grandmother! Edith Pierce married Jerimiah Clements, my 10th great-grandfather. It is so amazing to me, that I happen to share the Pierces and the Clements with other genealogical researchers–making us cousins now as well as friends! Nicholas Martiau, see his blog, post–only his granddaughters Mary and Jane Scarsbrook, 1654-1685 are my direct descendant, not Nicholas or his wife. From Jamestown Rediscovery we learn that the “Recent discovery of the exact location of the first settlement and its fort indicates that the actual settlement site was in a more secure place, away from the channel, where Spanish ships could not fire point-blank into the fort. Almost immediately after landing, the colonists were under attack from what amounted to the on-again off-again enemy, the Algonquian natives. As a result, in a little over a month’s time, the newcomers managed to “beare and plant palisades” enough to build a wooden fort. Three contemporary accounts and as ketch of the fort agree that its wooden palisaded walls formed a triangle around a storehouse, church, and a number of houses. It is amazing to realize that my own 9th great-grandfather Nicholas Martiau, a Huguenot, French Engineer, helped design and build the improved palisades around the Jamestown Fort in 1620, allowing for the survival of some of the settlers during the 1622 Indian Massacre. While disease, famine, and continuing attacks of neighboring Algonquins took a tremendous toll on the population, there were times when the Powhatan Indian trade revived the colony with food in exchange for glass beads, copper, and iron implements. It appears that eventual structured leadership of Captain John Smith kept the colony from dissolving. The “Starving Time” winter followed Smith’s departure in 1609 during which only 60 of the original 214 settlers at Jamestown survived. That June, the survivors decided to bury cannon and armor and abandon the town. It was only the arrival of the new governor, Lord De La Ware, and his supply ships that brought the colonists back to the fort and the colony back on its feet. Although the suffering did not totally end at Jamestown for decades, some years of peace and prosperity followed the wedding of Pocahontas, the favored daughter of the Algonquian chief Powhatan, to tobacco entrepreneur John Rolfe. The Algonquian eventually became disenchanted and, in 1622, attacked the out plantations killing over 300 of the settlers. Even though a last-minute warning spared Jamestown, the attack on the colony and mismanagement of the Virginia Company at home convinced the King that he should revoke the Virginia Company Charter; Virginia became a crown colony in 1624. The fort seems to have existed into the middle of the 1620s, but as Jamestown grew into a “New Town” to the east, written reference to the original fort disappear. Jamestown remained the capital of Virginia until its major statehouse, located on the western end of Preservation Virginia property, burned in 1698. The capital was moved to Williamsburg that year and Jamestown began to slowly disappear above ground. By the 1750s the land was owned and heavily cultivated, primarily by the Travis and Ambler families. You can read or listen to the history of Jamestown in so many places, I have not tried to tell you even half of the history here. I have included a video which is very instructive in the history. I am going to list some of the websites I utilized as well, especially the ones with the lists of settlers, much more than the beginning ones listed here: From the website Historic Jamestown, , Understanding America’s Birthplace, we find this list of the very first settlers and their occupations! son of Col. James Steptoe Sr., M.D. daughter of James Steptoe Jr. This is IT! I did it! I completed writing about 52 Ancestors in 52 Weeks! Actually, more than that as many posts dealt with multiple ancestors like this one! What a difference a year makes! 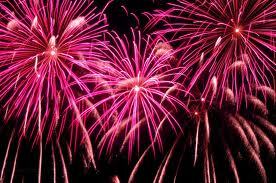 Fifteen years ago, I was told I would only live five years or so, now this year, my fifteenth year of survival with severe heart disease, I have accomplished this challenge, and I have written a novel! Amazing!Thanks to Amy Johnson Crow for issuing and maintaining the challenge, and thanks to all the other authors who’ve shared their techniques and their family stories! I could not have done all of this without the support of my family and friends who have encouraged me every step of the way! Thank you so very much! It has been a wonderful experience! –Jamestown Settlement and Yorktown Victory Center, http://www.historyisfun.org/jamestown-settlement/jamestown-ships/? Categories: 52 ancestors' stories in 52 weeks, Callaway famiy posts, Cary family posts, Genealogy, Houchins family posts, Jamestown Ancestors, Langhorne Family posts, Martiau family posts, Pierce/Pearce family posts | Tags: 52 Ancestors in 52 Weeks Challenge, Capt. Christopher Newport, Capt. William Pierce, Frances Fairfax, Genealogy, Henry Cary, Jamestown Ancestors, Jane/Joan Phippen Pierce, Jerimiah Clements, John Browning, John Pinkard, Miles Cary, Nicholas Martiau, Peter Beverley, Robert Beverley, William Hatcher | Permalink. Correction and Update, April 24, 2018. Upon researching more thoroughly I discovered that I had made a mistake in my research for this blog post. As it turns out, Nicholas Martiau is not my 9th Great-Grandfather. I can only apologize and set the record straight for those who used this blog post as evidence for their own relationship to Nicholas Martiau. As it turns out, while Nicholas Martiau’s daughter Mary Jane Martiau, 1631-1701 did marry my 8th great-grandfather, John Scarsbrook, b. 1627. they only had two daughters together. My ancestor John Scarsbrook born 1676, was the son of John Scarsbrook, 1627, and his second wife Elizabeth, unknown maiden name. (Note: 1. 1679: Mrs. Elizabeth BUSHROD wrote her will. She names Elizabeth, wife of Col. John SCARSBROOK. 2. 1679, 18 Apr: John SCASBROOK of York Co. wrote his will. He named his two oldest daughters Jane DUKE and Elizabeth CONDON executrices and directs that anything recovered from Mrs. BUSHROD’s estate be divided among his four minor children, Martha, Mary, Hannah and John SCASBROOK. ) Even though Nicholas Martiau may not be my direct ancestor, he is an important figure in American history, and I am pleased to have learned about him. The rest of the history included in this post about Martiau is correct, only our relationship was incorrect. In working on my genealogy of ancestors from the Jamestown Colony, I learned of a man named Nicholas Martiau, 1591-1657, who holds a strong place in American and Virginia history! He was a French Huguenot, a military engineer appointed by King James I (King James VI of Scotland) of England, at the express petition and sponsorship of the Earl of Huntington, to come to America and help build the fort at Yorktown, Virginia. 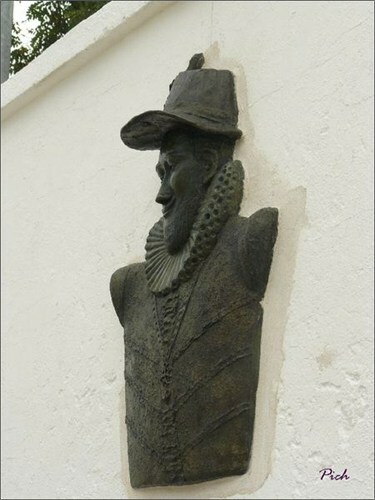 He served as a Burgess from Jamestown in 1623. Many, many stories are written about Nicholas Martiau on ancestry.com, some of which contradict each other, unfortunately. However, between these and the scholarly works like that of John Baer Stoudt’s book entitled Nicolas Martiau–Adventurous Huguenot, certain facts emerge. Nicholas was born in 1591 on the Ile de Re, France, and raised a French Huguenot who learned to speak English by reading the Bible. Due to the religious persecution of Huguenots, his family escaped to England where he was naturalized English and was registered in a Huguenot church there. He left England and sailed for Virginia on the ship Francis Bona Ventura (sometimes seen as Francis Bonadventure) arriving in June 1620. His construction of a fence or palisade around the Jamestown Fort helped the settlers survive an Indian uprising in 1622. He was also instrumental in constructing the palisades at Yorktown, Fort Story, and Old Point Comfort, Fort Monroe. He can be seen in the first census taken in Jamestown in 1624 and was elected to the House of Burgesses from the colony. Later he served as a Burgess from Elizabeth City, Yorktown, and the Isle of Kent. Nicholas also served as a Justice for the early court system of Virginia–with court sometimes being held in his home. 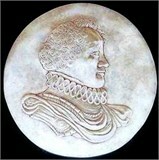 Nicholas received land patents for bringing people over from England, and later as rewards for his work. He settled on a 1300 acre plantation on the York River. His home apparently sat on a bluff overlooking a curve in the York River where it connects with the Chesapeake Bay. What a beautiful place to live that must have been! Nicholas did not live to see his land become the modern-day site of Yorktown, Virginia, but his grandson donated or sold, depending on the report, 50 acres of land for the original site of that vibrant town in 1691. The town’s creation established Yorktown as the principal location for shipping and receiving tobacco, and other goods via the port. Wharves, warehouses, and other business buildings were established at the riverfront. In 1931, a monument was dedicated to Nicholas Martiau by the Martiau-Washington Memorial Association commemorating his accomplishments and his illustrious descendants like George Washington; Governor of Virginia, Thomas Nelson; and Confederate Commander Robert E Lee. An eleven-foot tall slab of Vermont granite, the monument sits on Ballard Street in Yorktown near where Martiau made his first home upon arrival in Virginia. We know that Nicholas was married three times. unfortunately, the name of his first wife and perhaps even two children are not recorded or at least have not been discovered at this writing. They are recorded as having arrived after him on a separate ship. It is assumed that they died soon after arriving as did so many settlers. In 1625, Nicholas married Jane Page Berkeley, the widow of a prominent man named Lt. Edward Berkeley–marrying her increased his social status. Together they had a son Nicholas who died without children as well as a son Richard who died at age ten. Their three daughters, however, grew to adulthood and made great matches leading to the founding of many prominent Virginia families. His will can be found in the Virginia State Library in Richmond, Virginia and names his three daughters as Elizabeth,b. 1625 who married George Reade and leads to George Washington; Sarah, b. 1629 who marries Capt. William Fuller; and Mary Jane, my own 8th great-grandmother who marries my 8th great-grandfather (convenient) John Scarsbrook. 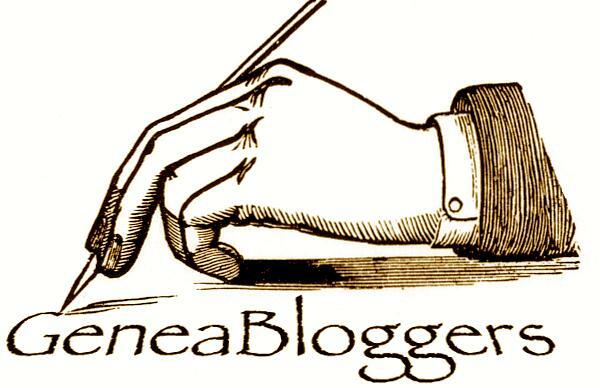 Nicholas marries a third time after Jane Berkeley’s death to Isabella, the widow of both Capt. Robert Felgate and George Beech with no children from this marriage. Less you think Nicholas was a mild-mannered man, I’ll share one story that tells us more about his character. In 1635, Nicholas was a leader in a revolt against the tyranny of Royal Governor, Sir John Harvey. This was the first revolt against British authority in Virginia. For his efforts, he was arrested and confined –but only for a brief while as Governor Harvey was deposed and Martiau released! He was a strong patriot, and it is interesting that his daughter Mary Jane married John Scarsbrook who was a leader in the Bacon rebellion! 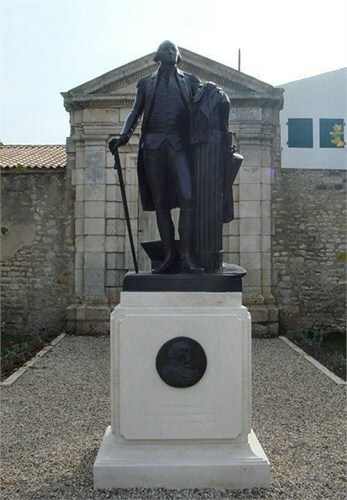 In St. Martin de Re, France, where Nicholas Martiau was born, in a garden behind the Ernest Cognacq Museum, there is a statue of George Washington, with the base of the monument featuring a crest representing Martiau and his relationship to George Washington–dedicated by the American ambassador to France in 2007! Another caveat of being a descendant of Nicholas Martiau is that it qualifies them to join several “historical” organizations. One is “First Families of Virginia”, because Martiau arrived before the first census was taken in 1624. His living in Jamestown qualifies his descendants for membership in the Jamestown Society also. Another important group to preserve our ancestor’s history is the “Nicolas Martiau Descendant Association”. If I were going to join these groups however, my favorite I believe would be to belong to the august group of women with ancestors dating to early colonial Virginia called the “Grand Dames of Virginia”! 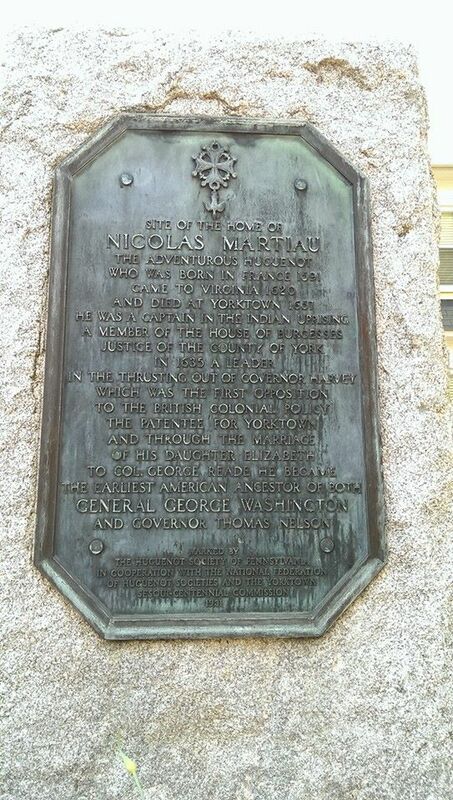 After writing this blog post, in May, 2014, my daughter Ali Holshouser Orcutt and her husband Greg Orcutt took their children to Yorktown where Greg took this picture of the plaque in Yorktown, Va. honoring Nicholas Martiau. Categories: 52 ancestors' stories in 52 weeks, Genealogy, Langhorne Family posts, Martiau family posts | Tags: 52 Ancestors in 52 Weeks Challenge, First Families of Virginia, France, Genealogy, Grand Dames of Virginia, Jamestown, Jamestown Society, Nicholas Martiau, Virginia, Yorktown | Permalink.